Born in Toda-shi, Saitama. Started to learn TSUGARU ZAMISEN at 17. She got NATORI under the instruction and guidance of Sawada Katsuaki, the top TSUGARU ZAMISEN player. In 1999 she became independent from Sawada-ryu. She joined TSUGARU ZAMISEN Music Group "MIRAI" and started professional career of a performer. 1999 - she got the prize of group performance at the 11th Japan Competition of TSUGARU ZAMISEN in Kanekicho, the birth place of TSUGARU ZAMISEN. Attended as a member of the Japan - China culture exchange Mission the 3rd Japan and China music festival on 50th anniversary to China in Beijing. 2000 - she got the prize of group performance at the 12th Japan Competition of TSUGARU ZAMISEN in Kanekicho, the birth place of TSUGARU ZAMISEN. Released CD at the memory of the Japan prize by Victor entertainment. 2001 - attended the 12th Tokyo TOMIN concert "Dream of Music- HNEDA Kentarou and the associates -"
2002 - attended at Japan-china diplomatic 30th relation memorial concert "ENDO Ritsuko Jazz Trio & MIRAI"
2004 - attended AOMORI Japan tour in Kuala Lumpur. Debuted at the live house "November Eleventh" which is owned by UZAKI Ryudo and AKI Yoko. Joined "MIRAI & TUZUKI Akihiro LIVE Shanghai tour sponsored by Shanghai's Japan Commerce Club. Attended Aomori fair in Taiwan. 2005 - attended Aomori Japan fair in Bangkok which is broadcasted in Thailand. Performed many stages in Japan, China (Shanghai, Piking, Taiwan), Korea, Spain, Malaysia, and Thailand. She maintains traditional TSUGARU spirit and Japanese soul. Her solo performance as well as that group are in spotlight. 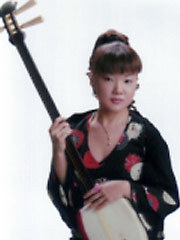 She is very much active to promote TSUGARU ZAMISEN developing the genre attending various sessions with other instruments.